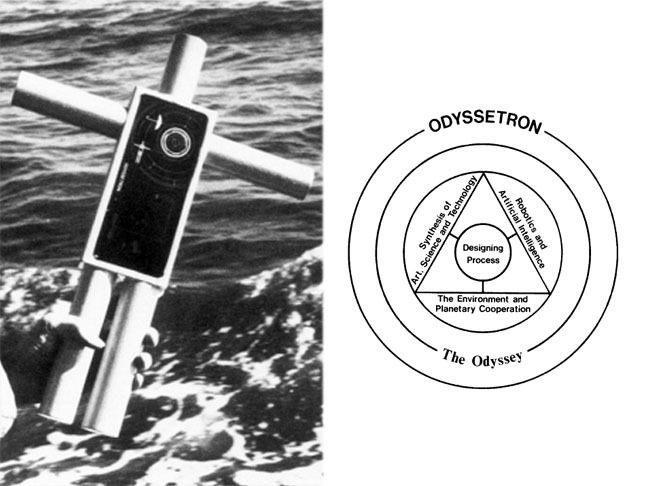 Directed by Former STUDIO Director Bryan Rogers, ODYSSETRON was a research project inspired by Homer’s Odyssey with the intent of completing the first robotic circumnavigation of the earth. 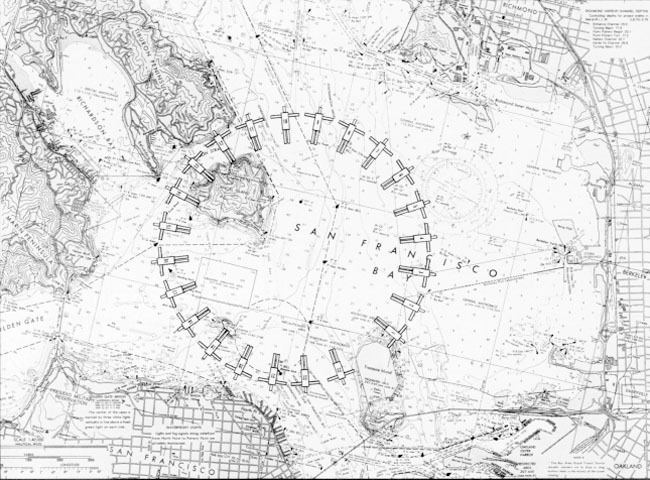 Odyssetron – A Cybernautical Metamodel – is a four-phase, long-term project inspired by Homer’s Odyssey. In the final phase Odysseus reappears after an absence of three millennia in the form of a robotic, marine craft seeking to circumnavigate the earth. The project responds to a paradox – a belief that humanity quests for transcultural unity and understanding, contrasted with an observation that our planetary social fabric is becoming increasingly fragmented. The project was featured in the Sao Paulo Bienal in Brazil (1985), and is fully described in an article by Rogers published in the journal Leonardo (Vol. 17, No. 3, pp 159-166, 1984). All four phases of the project centered around the launching of physical objects in designated locations on the earth’s water surface. During Phase I of the project, launched in 1980, 100 information-storing, free floating modules were deployed in an inland waterway system in the U.S.A. These modules carry graphic information which describes the overall project in general and Phase I in detail. Phase II focused on the launching of 64 information-transmitting, free-floating modules in the Pacific Ocean. The solar-powered modules periodically transmitted radio and audio information regarding the project. 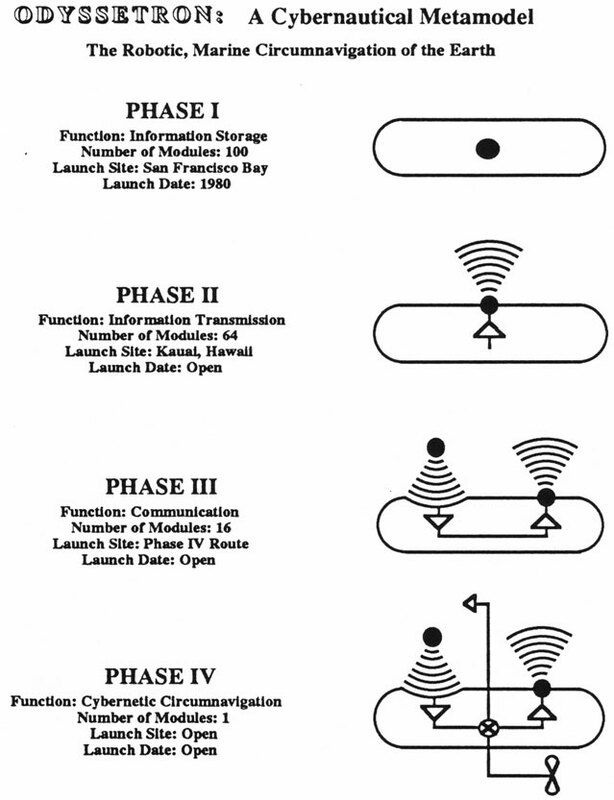 Plans for Phase III included launching 16 communicating modules, each capable of receiving information and transmitting a response. Stationed along the circumnavigation route projected for Phase IV, the modules tested the appropriateness of the route and herald the forthcoming robot. In Phase IV a single module – an operational cybernetic navigating system – was launched. It had communication and propulsion capabilities as well as the intelligence on board to circumnavigate the earth’s waterways on a prescribed course. The robotic craft was navigated with assistance from a navigational satellite and was remotely monitored but not remotely controlled. Once afloat, Odyssetron IV was on its own. Support for this project came from the National Endowment for the Arts, and the Panasonic, Dallas Semiconductor, NIBCO, and Franklin Software Corporations.